We are transforming materials into devices and systems that make our lives better. 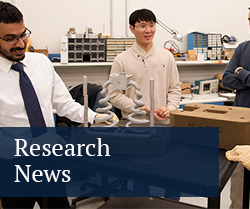 The mechanical sciences area covers a breadth of research related to the fundamental topics of design, mechanics of materials, controls, vibrations, dynamics, mechatronics, robotics, solid mechanics, optimization, and manufacturing. These fundamental topics are being used to improve devices in fields such as biomedical, energy storage, and transportation through theoretical, experimental, and computational research. With more than 60 faculty members, 330 graduate students, and 800 undergraduate students, the Penn State Department of Mechanical Engineering embraces a culture that welcomes individuals with a diversity of backgrounds and expertise. Our faculty and students are innovating today what will impact tomorrow’s solutions to meeting our energy needs, homeland security, biomedical devices, and transportation systems. We offer B.S. degrees in mechanical engineering as well as resident (M.S., Ph.D.) and online (M.S.) graduate degrees in mechanical engineering. See how we’re inspiring change and impacting tomorrow at me.psu.edu.